INNOVATOR Machinery is an international veneering machine manufacturer with the excellent quality and service in Taiwan. We specialize in designing, manufacturing, marketing and servicing various kinds of veneering machinery including guillotines, splicers and other veneer processing equipment for the decorative board, door and furniture industries as well as veneer and plywood processing plants. INNOVATOR Machinery also provides whole plant equipment planning to meet essential needs of our customers. 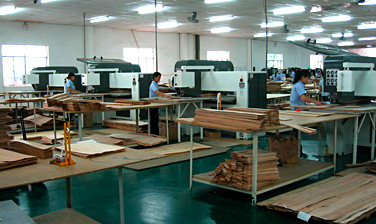 All kinds of cost-effective veneering equipment manufactured by INNOVATOR Machinery make veneers utilized significantly. An increasing shortage of timber available for processing and manufacturing extraordinarily makes veneering technology important from an environmental point of view. In 2008, INNOVATOR Machinery has even taken a big step further to acquire Danish SAVI Industri A/S, a well-known brand globally in veneer guillotine field since 1970s, for the brand and technical supports, including all blueprints and machine parts. (SAVI was also the top brand in both UK and USA market since 1990s.) Because of this, European superior quality with more than 30 years of guillotine experiences has remained. This perfectly completes our production line. When everyone is waiting for opportunities, all we do is go ahead and grab the chances which make us succeed. With more than three decades of experiences, valuable comments from customers and an outstanding reputation in the woodworking machinery industry, our machines marketed to more than 40 countries have been widely proven worldwide. We at INNOVATOR Machinery always do our best to provide the most innovative equipment and the finest service so as to derive the satisfaction of our customers. 08:00 a.m. ~ 12:00 p.m.
13:00 p.m. ~ 17:00 p.m. Copyright © INNOVATOR MACHINERY CO., LTD.